I’m a sucker for a good flowchart because they either can help to simplify analysis or they can show how something is very complex. This explanation of double taxation. This depiction of the no-win Greek economic crisis. Portrayals of Obamacare complexity here and here. I’d like to see a good fiscal policy flowchart, one that captures all the options for policymakers. I created a matrix early last year to illustrate some of the goals and tradeoffs, but it wasn’t comprehensive. 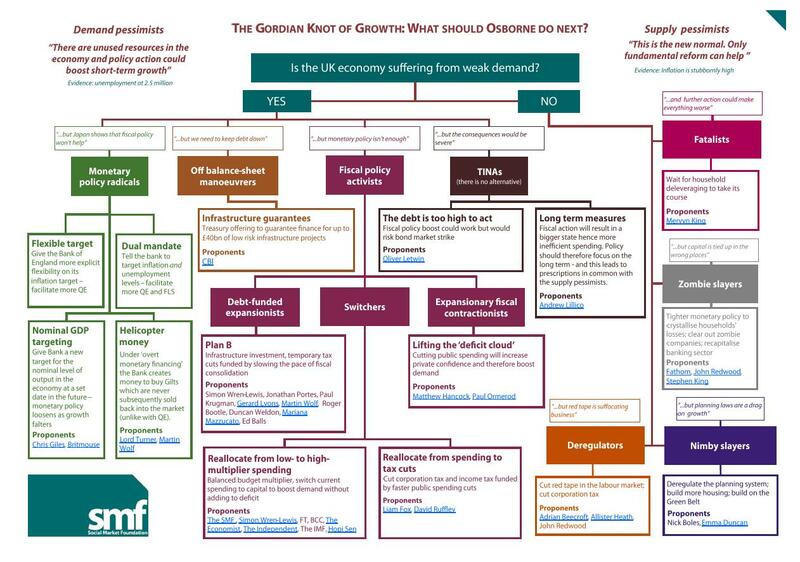 Well, the folks at the UK-based Social Market Foundation have stepped into the breach and put together a flowchart that seems to cover every option. They call it “The Gordian Knot of Growth.” It’s designed for the UK Chancellor of the Exchequer (akin to our Treasury Secretary and Office of Management and Budget Director), but I think the various boxes also capture almost all of the various policy prescriptions in the US. But notice that I said this flowchart presents “almost all” of the options. You’ll notice that there’s no box for “tax increases” or “higher marginal tax rates.” That will give you an idea of how Obama’s class-warfare tax policy is way out of the mainstream. In other words, the burden of government spending should be reduced and we should allow markets to allocate resources. How will decline unfold step by step? What is the sequence of weakest links in the economic universe? Nearly impossible to predict but irrelevant. Its like having a submarine on a route below crushing depth and debating which rivet will give in first (and blame that!). It is a useless exercise, a distraction on the way to being crushed. The submarine will implode. First the weakest rivet will pop, then that will redistribute stress a bit and another one will pop etc. the end is quick once the first rivet gives way, but that is not the cause. The pivotal point into the vicious cycle was 2008. That is when Americans decided to elect Obama to rectify Bush’s statism. The pitchforks will finish off America’s once enviable top prosperity. Reblogged this on Tin Foil Hat Book Club. They call it “The Gordian Know of Growth.” Knot?